Do you want to stay married to your spouse? If so, negotiating a Postnuptial agreement is one way to put some of the difficulties you have been having in your marriage on the table for an open discussion with your spouse. There may have been a loss of trust for one or another reason, and one or the other of you may wish to be able to have a sense of financial security and independence from your spouse in order to move forward with the relationship. Or there may be issues about the way you handle your finances or property that you had never discussed before, that you may want to address in a post-nuptial agreement. Below we have provided answers to many of the common questions about marital mediation and postnuptial agreements. If you would like more information please do not hesitate to call us at 508.655.5980 or e-mail us. A postnuptial agreement is a contract formed by a married couple, in the interests of strengthening their marriage, settling financial or legal rights of the couple allowing them to concentrate on more important discussions. A Prenuptial Agreement is signed before a couple enters into marriage while a postnup is signed after a couple enters into a marriage. That difference may seem simple but it results in potentially very different treatment of a prenup or postnup in the event of enforcement. A prenup must be determined to be valid at the time of the execution of the agreement, and fair and reasonable at the time of enforcement. A postnup is subject to additional “heightened scrutiny” by a court as to whether there was fraud/coercion and fair and reasonable terms. Ansin v. Craven-Ansin, 457 Mass. 283, 297, 292 (2010). This is because of the intimate relationship between the parties at the time of the forming of a postnup contract – one that leads to very different bargaining dynamics than a negotiation between unmarried persons who can choose to not get married. 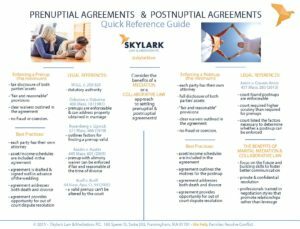 Is my Postnuptial Agreement enforceable? (5) the terms of the agreement are fair and reasonable at the time of execution and at the time of divorce (second look).” Ansin v. Craven-Ansin, 457 Mass. 283, 291 (2010). Whether the terms of an agreement are “fair and reasonable” under (5) above is determined by the courts in light of the factors that the Legislature has written into the law governing division of property and payment of support in the event of a divorce (Mass. Gen. Laws C. 208 §34), with the party requesting enforcement of a postnup having the burden of showing that the terms are “fair and reasonable” in light of these factors. “other circumstances the judge finds relevant”. Should I pursue a divorce instead of sign a postnuptial agreement? Do you want to stay married to your spouse? If so, negotiating a Postnuptial agreement is one way to put some of the difficulties you have been having in your marriage on the table, for an open discussion with your spouse. There may have been a loss of trust for one or another reason, and one or the other of you may wish to be able to have a sense of financial security and independence from your spouse in order to move forward with the relationship. Or there may be issues about the way you handle your finances or property that you had never discussed before, that you may want to address in a post-nuptial agreement. Do you want to separate from your spouse? If you are certain that the marriage has broken down and there is no hope of reconciliation, then it might make more sense to consider the benefits of transitioning to separate lives. If you’re not sure if you want to separate or not, mediation can help you decide by providing a safe neutral space for both of you to discuss your options and get additional information before making a decision. Can I contract for child support or other child-related issues in a postnup? The court must determine custody and support issues in the best interest of the child and therefore contract provisions that are not consistent with the court’s mandate won’t be upheld. In other words, postnup provisions that try to limit or define custody and child support are unlikely to be enforceable. Can we Mediate our Postnup? Mediation and Collaborative negotiation both support relationships through interest-based negotiation so they are ideal for considering everyone’s goals and creating joint agreements in a postnup.